What is another word for ranked? 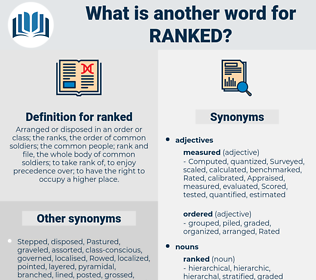 Arranged or disposed in an order or class; the ranks, the order of common soldiers; the common people; rank and file, the whole body of common soldiers; to take rank of, to enjoy precedence over; to have the right to occupy a higher place. Ranged, characterised, characterized, represented, representing, Indicated, arranged, reclassified, interpreted, Appeared, considered, Worked, conferred, identified, declared, Existed, recognized, described, perceived, contained, Awarded, qualified, elaborated, Regarded, allocated, pronounced, assumed, reported, granted, Arrived, Served, Assessed, occupied, occupy, Occupying, Mentioned, advised, Accorded, treated, featured, finished, Instituted, dismissed, Scored, Alluded, included, Happened, noted, Performed, Amounted, outlined, Became, allotted, Commented, specified, Referred, ruled, attached, Reached, Brought, Stood, disclosed, filled, laid, centre, planted, figure, figured, seized, Deemed, Provided, es, sorted, touched, Allowed, Dealt, played, Came, held, Cared, Believed, Accounted, Filed, placed, Cited, Was, Were, lay, found, felt, Looked, cote, dropped, Viewed, Took, stated, au, saw, dumped, el, Lived, put, named, Acted, classified, terminated. categorized, Subordinated, disaggregated, assigned, apportioned, acknowledged, designated, characterised, characterized, earned, Amongst, ascertained, categorised, Attributed, Indicated, appointed, distinguished, measured, arranged, attained, ordained, recognised, aggravated, Annotated, Appraised, interpreted, inscribed, evaluated, organized, broken, ordered, accredited, Appeared, prioritised, hailed, Adjudicated, Anchored, considered, nominated, dominated, Construed, prioritized, identified, accrued, declared, entrenched, discharged, organised, recognized, discontinued, enrolled, Inserted, branded, described, Denoted, valued, marked, estimated, determined, Prosecuted, analyzed, distributed, Enshrined, perceived, decreased, skilled, contained, annoyed, separated, referenced, subdivided, Entered, Obtained, prepared, Afforded, labelled, Awarded, qualified, Remanded, criticized, registered, bestowed, diagnosed, maintained, Tabulated, trained, Regarded, allocated, Retrieved, received, recorded, structured, assumed, reported, granted, established, Captured, Compiled, Ascribed, presented, Created, Assessed, occupied, archived, Mentioned, advised, Accorded, Achieved, treated, upgraded, Indexed, featured, defined, finished, situated, Instituted, dismissed, Scored, reflected, Displayed, selected, restricted, Commended, included, Collated, concluded, derived, educated, judicata, subsumed, accepted, documented, observed, Summoned, noticed, collected, suspended, adjusted, Gained, Termed, Followed, noted, become, scheduled, presumed, outlined, disposed, riled, blamed, Nailed, grouped, divided, enclosed, cleared, allotted, depicted, upset, specified, ruled, attached, invested, credited, reviewed, traded, secured, Numbered, disclosed, processed, centre, paid, Counted, packed, solved, moved, priced, planted, devoted, chosen, stored, figured, Deemed, sort, headed, sorted, Lodged, covered, suited, Allowed, Slotted, Shown, Believed, directed, Singled, embedded, Been, Filed, placed, seated, applied, Cited, poised, Quoted, Taxed, embodied, found, felt, pissed, Looked, Judged, Pushed, tried, vested, aged, Weighed, dropped, tested, Viewed, CODED, Housed, stated, mounted, au, won, focused, given, seen, Shifted, put, kept, named, Gotten, classified, classifiable, terminated. General Price, though he ranked him by a grade, replied that he was not fighting for distinction, but for the defense of the liberties of his countrymen, and that it mattered but little what position he occupied. Their attack was hopeless, but its bravery ranked perfect. running head, rancid, renegotiate, rain shadow, ringgit, rearmost, range hood, ram's-head, Rana Cascadae, ransacked, ramjet, raincoat, renegade, ring out, Rancidity, remicade, reinstate, reenact, rehnquist, renegociate, romanist, ringside, ringed, running suit.